Aren’t these adorable? And delicious too. Oh – and vegan AND gluten-free. When I finished my “balls, bites and bars” series a while back, it was because I felt that I had pretty much shared the most diverse recipes in the bb&b category. When it started to feel repetitious it was time to call it quits. 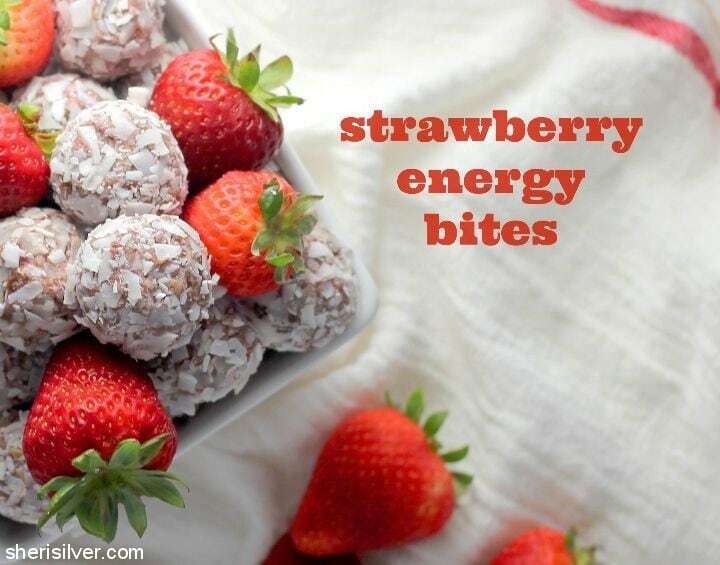 But when I came across these delightful little bites on the equally delightful blog Spartan Life, I couldn’t not share them with you. Natalie shares delicious, plant-based recipes and beautiful travel photos and is definitely a worthwhile read. I had all the ingredients I needed on-hand and was thrilled with how easily and quickly these came together. The hardest part? Letting them set in the fridge before rolling in the coconut. I think what really sets this recipe apart is the use of fresh fruit. Most balls, bites and bars (and ALL of mine) use dried fruit. 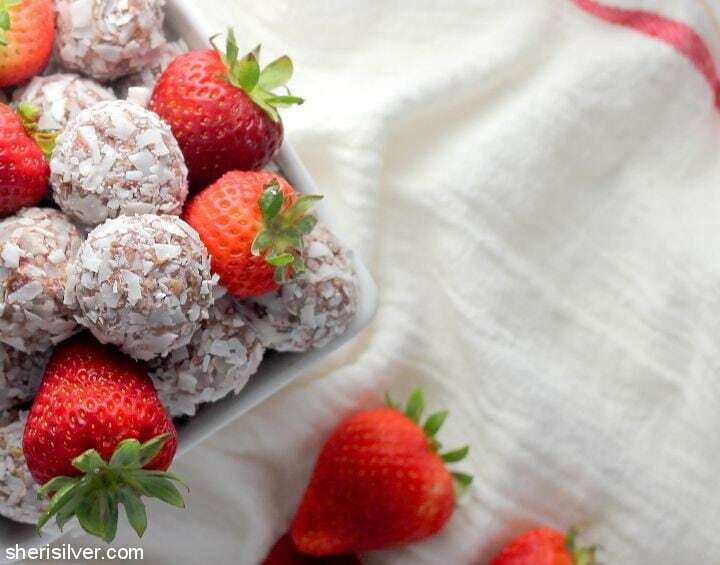 The fresh strawberries add really bright flavor and color, and I love the roll in coconut flakes (though you can opt out if you’re not a fan). Give these beauties a try! Place all of the ingredients except the coconut chips in your food processor. Process till the nuts are finely ground. Using a small spoon or cookie scoop, scoop tablespoon-sized mounds onto a lined baking sheet. Refrigerate for a few hours, or till firm. Clean out your processor and place the coconut chips in. Process till coarsely ground. Roll the chilled bites into balls and the roll in the ground coconut chips, coating completely. Keep covered in the fridge. 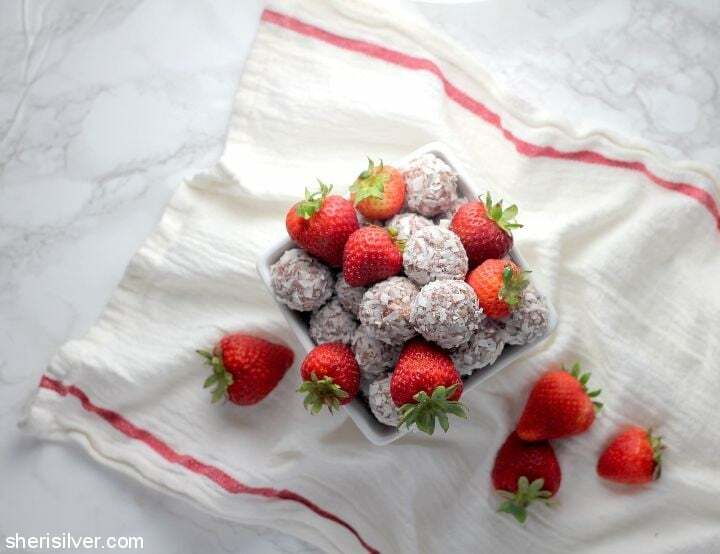 Get all of my balls, bites and bars – plus more snacks, vegan treats and wheat-free recipes – on Pinterest!